“Astronomy compels the soul to look upwards and leads us from this world to another,” or so says Plato in The Republic. But luckily for our winter-weary souls, we have only to look to downtown D.C. The latest installation at Hemphill Fine Arts’ satellite project space near Farragut Square, “Cosmic Modules,” is already, er, out of this world. 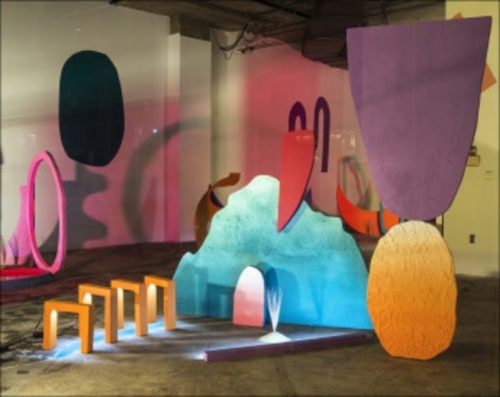 Drawn from the kitschy extraterrestrial realms of sci-fi B-movies, the installation features small-scale neon landscapes by D.C.-based artists Rachel Debuque and Justin Plakas, who make up PLAKOOKEE. Debuque and Plakas have previously worked together on a handful of projects, but “Cosmic Modules” marks their introduction under the shared moniker. Like their other collaborations, this installation is rife with color, light, and whimsy. It’s fairly easy to spot the gallery, whose windows blush demurely with color, if you’re walking down L Street. The brightly painted land masses of “Cosmic Modules” cast enigmatic shadows against the walls under a foreign sun. Many of the miniature vistas have their own built-in lighting element, and industrial work lights shine through large swatches of tinted, transparent plastic film, bathing everything in an ethereal warm glow that at night spills onto the sidewalk outside. But there’s a staginess to the exhibition that keeps it earthbound. The installation’s biomorphic forms, all hues of purple, orange, and teal, are as cartoonish as they are otherworldly. It’s as if the backdrops from Adult Swim’s Rick and Morty were rendered in 3-D. Additionally, neither the light fixtures nor their cords are hidden, lending the gallery a film-set feel. Just like a movie, these vistas seem intended for a screen—their vibrant incandescence is only amplified when captured on an iPhone. Under a camera lens, the tangle of electrical cords and plugs disappear, allowing the fantasy landscapes to be fully realized. Further strengthening the cinematic vibe of PLAKOOKEE’s installation is its retail-ready corner real estate. Complete with wraparound floor-to-ceiling windows, Hemphill’s L Street space has an undeniable air of voyeuristic consumerism. In a way, the glass barrier of the gallery’s windows serves as the definitive viewing screen. Because the gallery doesn’t have regular hours, they advertise the show as a dynamic diorama, where it can be looked at from various angles (but not entered) around the clock. Most visitors will have to settle for seeing “Cosmic Modules” from the street, a vantage point from which its landscape components are decidedly less modular. Instead, they form a collective topography—woodlands to the east, a sea to the west, rainforests toward the south, and a mountain range down the middle. The gallery has effectively rendered its own self-contained alien world. What beings inhabit this mysterious planet? There are no signs of life evident in the landscapes themselves, but the shrunken proportions of the installation make humans feel like intergalactic invaders. The average visitor dwarfs the installation’s structures, which range in height from about five feet to under 12 inches. Indeed, on opening night, it took a small child a few seconds to decimate a bridge that spanned a yard-long river. The tried-and-true sci-fi storyline may be rooted in our own fears of annihilation, but PLAKOOKEE’s installation reveals that the capacity for devastation is relative. Perhaps it is we who are the destroyers.